One of the hardest things for me to accept with INAD is the realization that I may never get to hear the words, "I love you, mommy." Grace does say ma ma sometimes, and I truly think she tries to say "I love you," some. But ask me what I want most from a cure for INAD, and it's to hear those words. That being said (or written), those are still just words. And words without actions are meaningless. Grace may not be able to SAY "I love you, mommy" but she sure finds ways to show me every day. There's her beautiful smile every single morning when I go into her room, and then countless other times throughout the day. There's my favorite snuggles when she's tired, and even pats on the back when you hold her. Yup, there's no doubt in my mind that Grace loves me, even if she never has a chance to say those words. And I truly believe that will be one of her lasting gifts to our community, showing others how to love one another. Our community has truly responded in kind, showing just how much they love us and love Grace. Our blog has been FULL of wonderful acts of kinds and awesome events people have planned for us. Today's blog will be full of more wonderful ways we have been shown just how much we are loved. 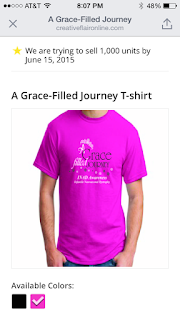 Earlier this spring, Renee Wynn, owner of Creative Flair in Litchfield, asked Kyle if she could design a T-shirt for Grace as a fundraiser for our family and the study, and we were very excited. At so many of the events we have been to this spring, we have thought it would be cool to have Grace shirts to wear, and Renee is making that happen for us. These are the AWESOME shirts you can buy from Creative Flair in Litchfield. Well, not just for us . . . anyone can get a Grace shirt. They come in pink and black, and are just awesome. I can't wait to see people sporting their new "Grace Filled Journey" shirts when we are out and about. There's still time to order some if you are interested. Just click the link, and the shirts can be shipped to your home or picked up in Litchfield. Just after we started our fundraising efforts for the INAD research study at Washington University, my good friend, Jill Paden, had a great idea. She manages one of the Casey's General Stores in Hillsboro, and she asked if she could put out a canister on the counter to collect spare change with a photo of Grace and some information about INAD during the month of February. After talking to her boss, the two of them hatched an even bigger plan, to include canisters at all three Casey's stores in Hillsboro and the two in Litchfield, and the fundraiser would run the entire month of March. Grace is all smiles with the managers of the Casey's stores who helped us out. It was pretty cool, we launched it in the newspaper on February 28, which just happens to be Rare Disease Day. And let me just tell you . . . spare change adds up. After the first full week the canisters were out, Jill brought the money by the newspaper office. Are you ready for this? It was nearly $900. . . in just one week. After all four weeks, they ended up raising over $2,300, and we were so very grateful. It's just a testament to our awesome community, and they way they continually show up to help others in need. We met again after the fundraiser, and they bought Grace a bell and a package of M&Ms. She was thrilled. Another friend called me in April. Lori Heise, who is the daughter of my dear friend Martha Sperry, is the Student Council sponsor at Litchfield Middle School. She called to tell me her group had planned a dodgeball tournament as a fundraiser for Grace. The tournament took place during the school day among all three grade levels. Students could pay $1 to play or $1 to get out of class and watch the tournament. They had one winning team in each grade level, and then an overall champion team. All these awesome kiddos helped raise money in the LMS dodgeball tournament. I felt honored to bring Grace by for a newspaper photo op, and a chance for her to meet the students. That's been one of our favorite things to do to take Grace around to the fundraisers to meet the people that are showing us such love. It's fun to see the kids talk to her and watch out for her, and she always wows them with her gorgeous smile. Lori told me she would gather up the kids for the photo, and I think it was nearly the entire student body that participated in the fundraiser. The kids raised over $150 for the study, and had a pretty good time at the tournament too. I think it's safe to say that I have eaten hundreds of pork patties in my lifetime, and believe it or not, it's usually for a pretty good cause. Area organizations host pork patty sales at lunchtime throughout the summer, and we can usually be found stopping by for a quick bite to eat. Chuck McDowell, president of the Hillsboro Lions Club, called in March, to ask if the Lions Club could host a pork patty fundraiser for Grace on April 17. We already had plans to be out of town that day, so we told them they could do the fundraiser, but we wouldn't be able to come by. Out of all the fundraisers and events this year, I think this is the only one we haven't been able to attend in person. About a week after the pork patty sale, another club member, Earl Meier, called to arrange a photo opportunity for the newspaper. He wanted us to meet them at Tremont Ridge Assisted Living Facility in Hillsboro for a very special presentation. The Hillsboro Lions Club presented us with $1,500 from the pork patty sale. Since we were gone the day of the fundraiser, we didn't really know how things went. Apparently, they went VERY well. The Lions members said they sold more than 500 pork patty sandwiches, and presented us with a check for $1,500. They told us that people were still stopping to try and buy pork patties as they were closing up, and said others came just to give a donation. But the biggest supporters of the pork patty sale that day were the residents of Tremont Ridge. They ordered 50 lunch meals for all their residents and staff in support of "A Grace Filled Journey." When we stopped at Tremont Ridge, they had a special gift for Grace too. Administrator Ceressa Waldrup presented Grace with her very own pink, sparkly Tremont Ridge shirt, as well as a monetary contribution from their residents and staff. Grace got her very own sparkly Tremont Ridge shirt! We also had a chance to share our story with residents and thank them for keeping us in our thoughts and prayers. We even promised to bring "Gracelets" back for all the residents. Ceressa invited us to stay for lunch, and we couldn't stay that day, but we plan to return one day this summer to enjoy some time with the residents. As a ten-year 4-H member in my youth, I've always had a special place in my heart for the county's 4-H program. I also served as an adult on the 4-H Foundation, where I got to know the county's Extension Director, Denise Kistner. 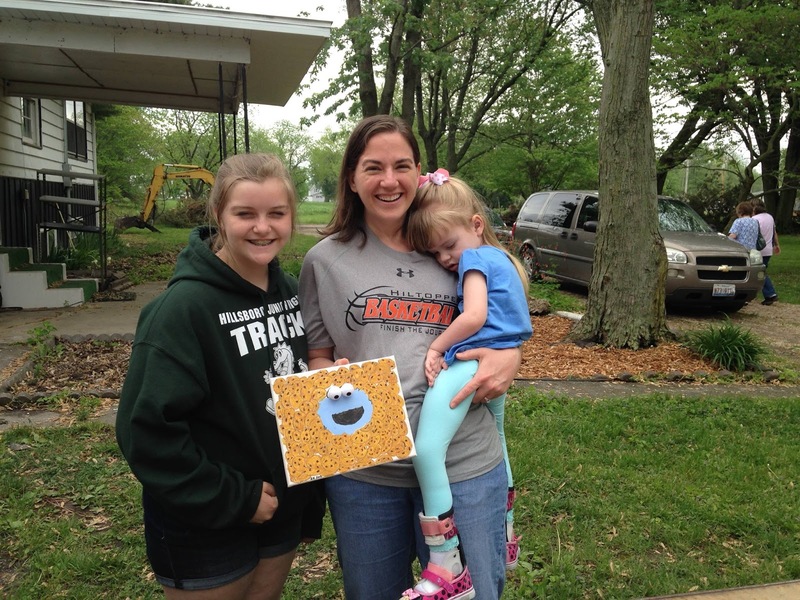 In April, Denise called me to say that her daughter, Erin's 4-H club, the Starr Shooters, wanted to host a bake sale and an art sale to raise money for the research study. 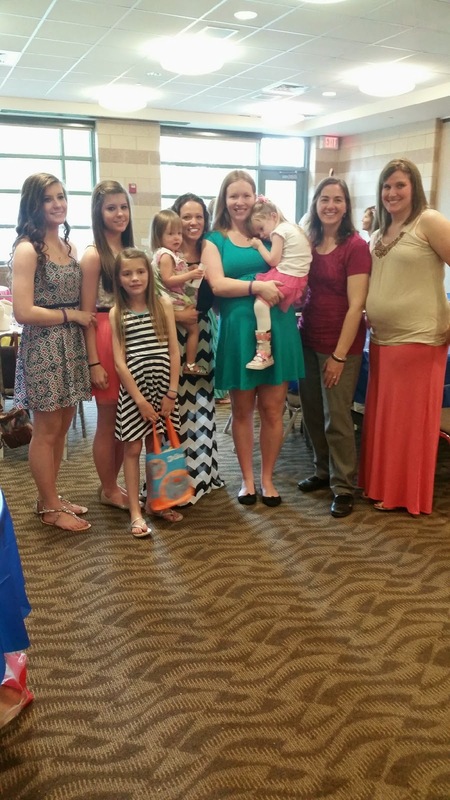 At their last club meeting, Erin had shared our story with her fellow 4-H members, and they wanted to help. It was the same day as the Witt City-Wide yard sale, and Kyle, Grace and I decided we would wander over there for some baked goods. Since we aren't real early risers, we didn't get over at the very beginning, and they told us what a success the bake sale had been with only a few plates of cookies left. Erin painted this Cookie Monster picture that we bought at the art sale for Grace's room. Erin had made a special bottlecap necklace for Grace with Olaf from Frozen on it. 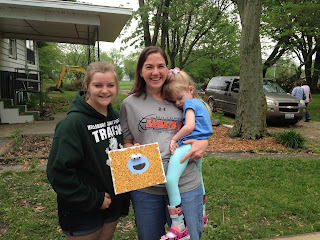 We also purchased a Cookie Monster painting that Erin had made or Grace's bedroom. Before we could make our cookie purchases, another shopper asked if she could buy some cookies for Grace. She picked out some sugar cookies, and Grace very graciously shared with us too. The dedicated 4-H members and their families raised $220 for the INAD study, and when Erin and her mom brought the donation by the paper, they also brought some cookies with them. I think they definitely know the way to our hearts. And Grace had never met a cookie she didn't like. I'd like for you to meet one of the most remarkable women I know, someone who's always been such an inspiration to me. And she's the most generous too. We have known Alexis for a long time, mainly because my mom stops by to see dad, Big Ed Wernsing, every Thursday on an ad call for the paper. I have filled in for mom a few times, and happened to catch Alexis at the store with her dad. She's always loved visiting with Grace. She even sent a special stuffed animal home with Grace from one trip to the store. Here's something you should know about Alexis. She was not projected to have a long life, but well, sometimes doctors are wrong. This spring, she continues her studies at the University of Illinois in Champaign, where she is a graduate assistant and hopes to be a professor someday. Oh, and she celebrated her 40th birthday. And instead of asking for anything for herself, she asked only for thoughts, prayers and donations for our family. To say I was honored would be a bit of an understatement. It was the most special gift anyone could ever give. Alexis finished up her spring semester at school and stopped by the newspaper office with a donation for the study as well as a stuffed animal from Grace. I told Alexis I wasn't sure if Grace could play with an Illini stuffed toy, since mommy is a Mizzou Tigers fan. But Alexis said it was purchased by a friend of hers, who wanted us to know people are praying for us in Champaign. It was the best day when Alexis and her mom stopped in at the office to see us. And we have an ice cream date sometime this summer too. We can't wait! Another e-mail came from a friend later this spring. Morgan Meade is the Curriculum Facilitator at Cornerstone Academy and Chrismont School in Nokomis. She said they wanted to host a "change wars' fundraiser for the INAD study. We were so thrilled. It's been neat that every school district in our county (and one outside it) have all joined our "Grace-Filled Journey," and we have loved visiting all the schools. The "change wars" was held the last few weeks of May, and we took Grace to the school on May 26 to meet some of the students. We talked to the middle school and high school classes, as well as one of the elementary school classes. The middle school class was the one that hosted the "change wars," and they studied a unit about community service. During their studies, they cut out articles from the newspaper about Grace to create a few posters for the hallways. 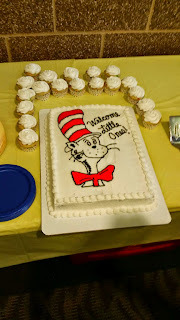 They were awesome, and my favorite one included student writings about "who, what, when, where, why and how." Having the chance to meet the students was fun for us, and it gave us a chance to tell them thanks for all their hard work and that they were making a huge difference for the study. The older students were pretty quiet, but the elementary students had a million questions for Grace, about her favorite colors and foods, and what she liked to do. They all took a turn coming up to say hi in person before departing for their classrooms. Some of the staff at Cornerstone with Grace and one of the posters the students made. In the end, the winning class that brought in the most change earned an ice cream party on the last day of school, and they raised more than $150 for the study. It was just an awesome experience, and we feel so blessed they did this fundraiser for Grace. All total, since the beginning of the year, we have been able to raise nearly $40,000 for the INAD research study at Washington University, thanks to our very generous family, friends and community. There are some days that I just wish, like Dorothy, I could click my ruby red slippers and head to a world where there is no INAD, where I could run and play with Grace all day every day. But, then I come back to reality, to a world where my family is so blessed to have been shown love time and time again. And I realize, there truly is no place like home. In July of 2012, Mary, Grace and I went on one of first family vacations with just the three of us. With some discounts from the paper, we headed down to Branson, which had been one of my favorite family vacation destinations as a kid. We had a great time during the trip. We swam. We played putt-putt. We went shopping. And of course, we went to Silver Dollar City. It was Mary's first time at the Ozark Mecca, but I'd probably been there 10 times in my youth. It was always a favorite of our family, so that's where we went for a lot of our vacations when I was growing up. We hit several of my old favorites like the glass blowing demonstration, the candle dipping place and the Tater Patch, which mixes up a little piece of heaven called calico potatoes in a six-foot wide skillet. My favorite part of the trip we found totally by accident. The Wallenda Family Circus was just finishing up their run at one of the theaters inside Silver Dollar City. We had just seen a special on Nik Wallenda a month or so before and had watched him walk over Niagra Falls on a tight rope on TV so we were pretty stoked to see him perform. Plus the theatre was air conditioned and our 10-month-old princess was getting cranky. The show was awesome, but the coolest part was getting to meet Nik after the show. We bought a picture of his famous walk over the falls and got an awesome photo of Mary and Grace with him. Just before we left, Nik signed the photo, making out the inscription to Grace. As we got back home, we put the photo in our spare bedroom, with promises of hanging it up soon. I had pretty much forgot about it until a few months ago when I came across it while looking for something else. As I read the inscription, I was floored. There in perfectly preserved black Sharpie was the following "Grace, Never Give Up! Nik Wallenda"
This was written when Grace was a perfectly normal little girl. There were no delays. There were no questions. There was no INAD. But almost three years later, INAD is our reality. We continue to hold out hope for a miracle, for a cure or a treatment for this awful disease. Since rediscovering the photo it has been perched on a shelf above Grace's bed. 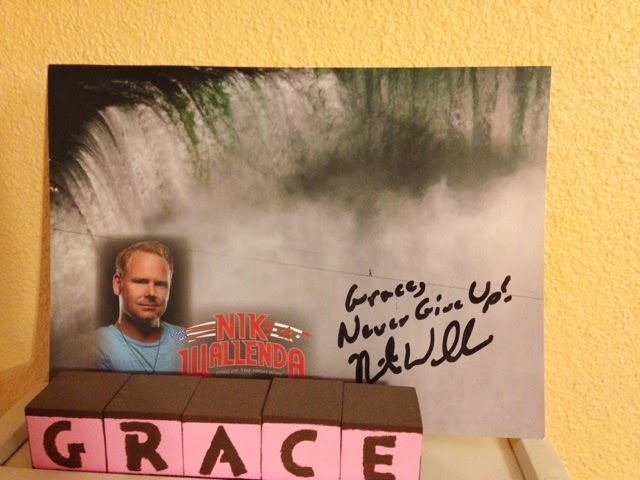 Nik Wallenda's words serve as a reminder to me to never give up regardless what stands in our way, whether it be a thousands of gallons of rushing water underneath a perilously thin wire or a rare and deadly genetic disease. 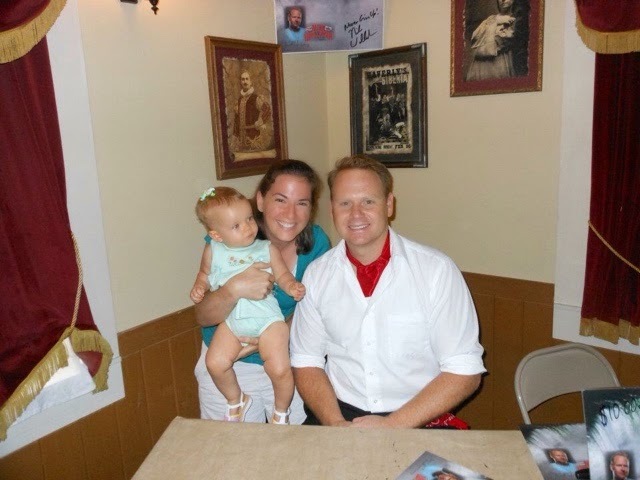 Mr. Wallenda will undoubtedly do more remarkable things in his career, but as far as I'm concerned, his words to Grace are the most remarkable thing he's ever done. Even if he doesn't know it. 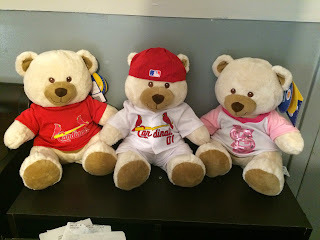 Friday marked a check-up with Grace's orthopedic doctor at Children's Hospital in St. Louis, and we always try to do something fun after a doctor's appointment or check-up. We usually try to plan all our appointments on Fridays because that's our day off from work, and it means we don't have to rush back. As it turns out, Friday is also a good day for Kyle's sister, Mikaela to join us on excursions, and this time her husband, Scott, took half a day off work, and we all met at the zoo. 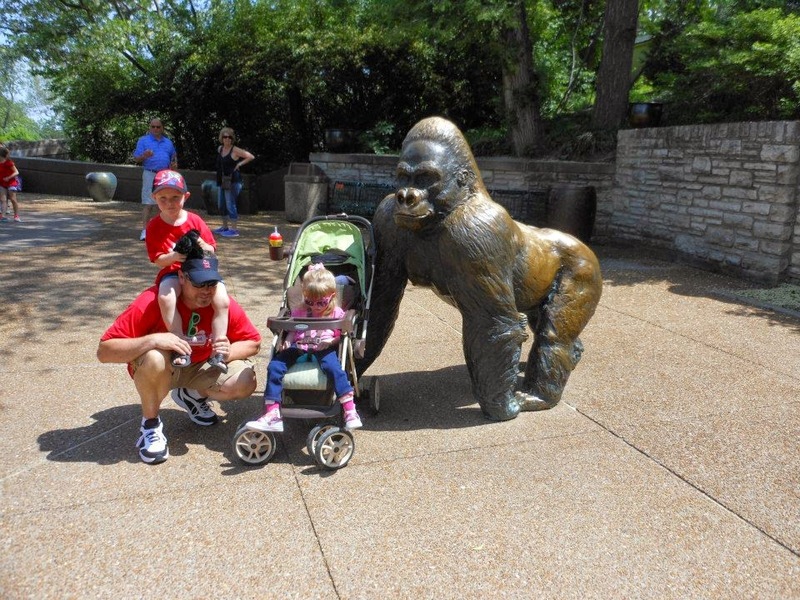 Just monkeying around with Uncle Scott and Aunt Mikaela at the St. Louis Zoo. Despite watching the iffy weather forecast all week, it was a pretty day when we left the hospital for the zoo, only to start raining moments after we got there. But we're used to making the best of a situation, so we headed to the Lakeside Cafe for some lunch to ride the storm out. Grace and her mommy are ready for adventures at the zoo. When we arrived at the zoo, we saw lots of buses in the parking lot, and the zoo was full of students on field trips. At lunch, I saw Kyle wave across the cafe at someone, and it turned out to be members of the Nokomis High School Lady Redskin softball team. Earlier this spring, they honored Grace at one of their home games, and let her throw out the first pitch. 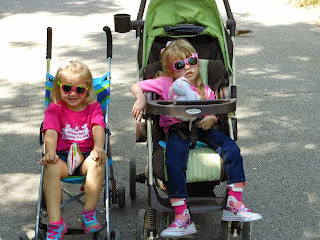 On our zoo trip, they came over and asked if they could get their picture taken with Grace, and we happily obliged. Grace seems to have a fan club everywhere we go. Here she stops for a photo with members of the Nokomis High School softball team. After having lunch with Scott and Mikaela, we ventured out to wander around the zoo. It was a little overcast, but still sunny too. I really thought we might even see a rainbow. Our first stop was the prairie dogs, which is one of Scott's favorite animals to watch. Since it wasn't too hot, there were lots of them out playing and eating, and we enjoyed watching their antics. There's always time for a family selfie! Then we made our way to the gorillas, which sort of turned out to be like "gorillas in the mist," as it started pouring down rain on us. We managed to find an overhang to hide under, and watched the gorillas, who seemed to like the storm about as much as we did. One stopped right in front of where Grace's stroller was parked. She liked watching him, but mostly liked just hanging out with the four of us while we waited for the rain to die down. For the next hour or so, we dodged raindrops and checked out the 1904 World's Fair bird cage, and then tried to find places to stay dry. We didn't let the rain damped our spirits, and just enjoyed visiting and being together. Even Grace didn't seem to mind the rain. The hippo exhibit is always one of our favorites. When it finally slowed up enough to wander around, we practically had the zoo to ourselves. We wandered around the River's Edge, and loved watching the hippos swim around their habitat. The elephants are always a favorite too. Still all smiles, even on a rainy day at the zoo. Before leaving, we decided to take Grace to the Build-a-Bear Workshop to make a new friend to take home. 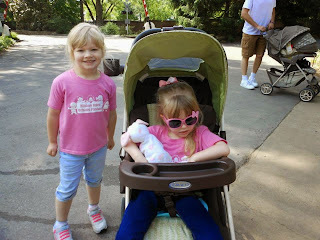 Wea settled on a pink flamingo, because that's one of mommy's favorite things to see at the zoo. With a little help from mommy, Grace got to press the pedal to fill the new toy with stuffing, and she got to add the red heart too after giving it a kiss. It's sure to be one of our new favorite friends to snuggle. Grace with her new Build-A-Bear friend, a pink flamingo! 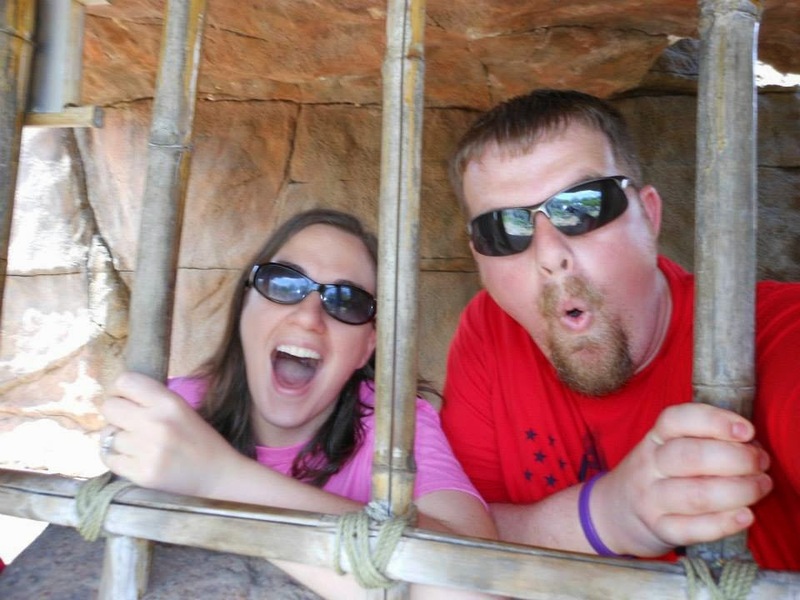 Before departing our separate ways, we stopped one more time in the sea lion tunnel to watch the animals swim. It was much less crowded this time, and we all enjoyed just watching them swim and play. A perfect way to end an almost-perfect day. In life, things don't always go how we plan them to. We certainly wouldn't have planned to visit the zoo on a day it poured down rain, but we definitely had fun "riding the storm out" together. Make the most of all your chances, and don't let a little rain spoil your fun. I have to admit that I don't consider myself very crafty. Part of it is a time issue. I just don't always make time to do things like that for myself. Another part of it is some issues I have with perfectionism. Sometimes, I drive myself absolutely crazy if I make something and it's not just so. But I'm working on it. My mom did teach me to cross stitch as a young girl though, and that's a hobby I do still like to do. Over the years, I've made placemats, pillowcases, baby bibs and even a Thanksgiving-themed apron for my aunt. Currently, I mostly do baby bibs for family and friends. The first reason for that is time. They don't take nearly as long as some the projects (I spent YEARS working on a picture I cross stitched for my mom as a gift at my wedding). The second reason is that I can do it in the car while Kyle drives us to and from therapy and doctor's appointments. Fortunately I don't tend to get carsick, and I can still visit with Kyle while I work. The biggest trend these days in crafting seems to be quilting, a skill I have never even attempted, although it's something I do admire. We have several handmade quilts that have been given to us as presents, and they are some of my very favorite things. Grace even has several that were handmade for her, and we still use them to snuggle. These are the flyers for the quilt raffle fundraiser. Yes, quilts are very special. And we certainly have a story about a special quilt. Several weeks ago, a longtime family friend, Helen Brinkman, contacted my mom about the possibility of doing a quilt raffle as a fundraiser for the INAD study. She had a quilt that was entirely handmade by a neighbor of hers, that's been gone for many years now. Helen said she was cleaning up the house and came across the quilt, which had been preserved in her cedar chest. It was the last quilt made by her friend, the late Flossie Simonin. After checking to see if either of her sons wanted the quilt, Helen decided she wanted to do something really special. She told me that she just couldn't bear the thought of it ending up on a $5 rack at an antique store someday. We took this photo for a news item before the quilt was raffled off. 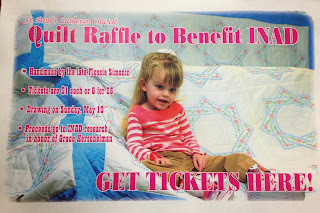 She partnered with her church, St. Paul's Lutheran Church of Hillsboro, to do the quilt raffle, and they started selling tickets just before Easter. Tickets were $1 each or six for $5, and when Grace and I stopped by the church to get our photo taken for a news item, they had already sold over 100 tickets. We offered to let them sell tickets at the newspaper office, and they also sold them at the church's annual spaghetti dinner (it's always one of our favorite fundraisers). Our newspaper editor, Mike, had to make posters for the spaghetti dinner, because they were afraid the quilt would smell like garlic if it was on display at the dinner. Mike contended that might be a perk. All the kids took a turn at mixing up the tickets, including one of Grace's classmates, Conner. 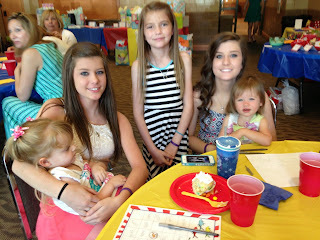 They decided to draw for the quilt on Mother's Day, and we decided we would go to the church that day to show our appreciation for all they had done for our family. After the service was over, they let each of the kids take a turn and mixing up thousands (yes, you read that right, I wrote thousands) of tickets before the official drawing, which was done by the former pastor's son, Jeff Sandlin. The lucky winner was Tracy Austin, and the raffle itself raised more than $2,100. The church added an extra $500 donation to the pot from their spaghetti dinner. Jeff Sandlin drew the winning ticket for the quilt raffle! We were completely blown away. The kindness and generosity of our AWESOME community continues to astound us over and over again. One of the most touching parts of the story was a donation from the quilter's son. He sent a contribution to Washington University for the study, and said he felt like his mom would have been pleased at how the quilt was used. The official check presentation with the lucky quilt winner. I may never take up quilting, but I will keep working on my cross stitch projects. Who knows, maybe someday they will be used for a really special fundraiser. I can't think of anything better. There was definitely a "Sweet Sweet Spirit" in the house tonight. And I'm SO blessed we got to be a part of it. 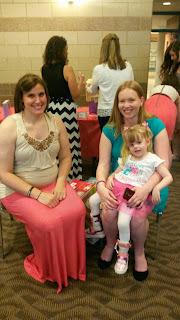 Several weeks ago, one of the other moms from Grace's preschool class told me she and her husband wanted to have a benefit concert for Grace. And I was moved to tears by their generosity. Tonight's "Singing for Grace" concert was amazing. Our friends Matt and Kay are such a blessing to us. At the time, Kay was expecting their third child, Edward Matthew, so she told me the concert would be after he was born in March. Shortly after he arrived, Kay sent me a message and said she and Matt were ready. Their church, the Christian Church of Litchfield, agreed to host the concert and the date was set for May 9. As they started planning the event, Kay asked me if there were any songs that Grace really liked. I told her that I always sing "Sweet Sweet Spirit" and "Amazing Grace" before I put Grace to bed each night, but I confessed that it was probably more because I liked them than Grace did. Matt and Kay Raffety "Singing for Grace" tonight. It's hard to say that Grace really has any favorite songs since she can't really tell us, but she's always really liked music. So, we knew she would love the concert. When we got to the church tonight, they had everything decorated princess-style. It looked fabulous. They even had a table with Grace's name on it, and some of her favorites, helium balloons! As we made our way to our seats, Kay brought some extra special goodies for Grace, a new tiara, a sparkly wand, a flower necklace and a princess badge. She wore her tiara and played with her wand the entire concert. She might have even been trying to direct the music a time or two. Princess Grace LOVED the concert. Then it was time for the concert to start. And the whole thing was beautiful. Matt and Kay's voices just blend so well together, and it was such a blessing just to share in their joy tonight. Although we didn't know many of the songs they sang, you could tell they handpicked the selections just for tonight. I especially liked "Try Not to Worry" and "Press On." They also sang the most wonderful version of "Amazing Grace" we've ever heard. That's always a favorite of ours, and it brought tears to my eyes tonight. Another favorite was the Louis Armstrong classic "What a Wonderful World." Matt helped the kids sing "Jesus Loves Me." During one part of the concert, they asked all the children in attendance to come up front and sing "Jesus Loves Me." I brought Grace to the front to sit with all the other kids, and though she couldn't sing along, I know she liked being a part of it. On our zoo trip on Thursday, Matt asked us if we had a montage of photos of Grace they could play during the concert. While we do have thousands, and I truly mean thousands, of photos of Grace, we didn't' exactly have anything like that put together. But we managed to pull something together, and they played "Sweet Sweet Spirit" in the background as our life story sort of unfolded in front of our eyes. It was one of my favorite parts. Kyle had a chance to share our story during part of the concert. It seems like I have written that a lot tonight that I had a lot of favorite parts, but it's just because it was such an awesome experience, and we feel blessed Matt and Kay shared their talents with us. We also felt so blessed to have many members of our families and friends present at the concert with us tonight to share in blessing with us. I know each and every person there tonight was blessed beyond measure. Two of my favorite princesses, Grace and her friend, Mia (Matt and Kay's daughter). We continue to be humbled and amazed by the outpouring of support our community has shown to us since Grace's diagnosis. And with everyone's help, we will find a cure for INAD. 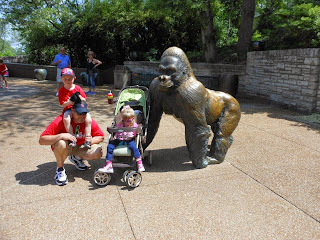 We were lucky enough to make our first trip to the St. Louis Zoo this year, on one of the prettiest days to date. This family had SO much fun on the preschool trip to the zoo! Thursday marked the annual zoo trip for Grace's school, the Hillsboro United Methodist Church Preschool. And though I don't remember any of it, I went on a zoo trip with that same school about 30 years ago. Preschool typically starts at 9 each morning, which means we usually arrive anywhere from 9:07 to 9:20, depending on the day. For the zoo trip, we had to be at the church by 7:30 a.m., which is a feat in itself, because some days we aren't even up at 7:30! But somehow or other, we managed to make it on time, and we weren't even the last ones there! Hanging out with her classmate, Mia, at the zoo. Excited students and their parents boarded two buses and headed out for the zoo. Grace was very good on the way up, and we enjoyed visiting with some of the other families around us. Gracie and her friend, Bailey! 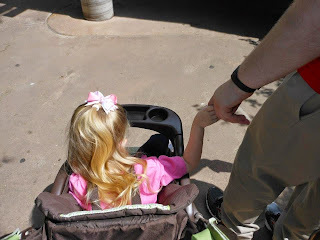 Once we got to the zoo, we split up and wandered around the zoo on our own. Kyle and I feel very fortunate to live so close to such an amazing zoo, and it's always one of our favorite places to visit. Time for a photo op with Conner and his dad! We started out at the River's Edge, which was near the entrance, and is home to the elephants and rhinos. Three of the elephants were out, including the baby elephant, so it was fun to see them eating their breakfast together. We also liked seeing the hippos in the water. Kyle liked watching two of them fight, and Grace just liked the fishes. After that, we headed to see the penguins. That exhibit was closed the last time we were at the zoo because of some renovations to the polar bear exhibit. It opens on June 6, and Kyle can hardly wait to go back! The penguins have always been one of Kyle's favorite animals at the zoo, and Grace really likes them too, especially when they splash. 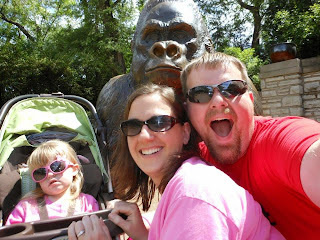 She just giggled and giggled, even though it's one of the stinkiest exhibits of the whole zoo! A selfie with daddy in the penguin habitat! After the penguins, we took a tour of the Jungle of the Apes. I was going to just leave Kyle there, but he kept following us. All of the apes seemed really active in their habitats, which was fun to see. Before our next animal encounter, we made a brief stop at the zoo cafe for a snack and a drink, and we just enjoyed a chance to visit. Mommy tried to leave Daddy at the zoo, but he managed to make it home. We had to meet the bus just after noon, but we made one more visit to see Big Cat Country. Many of them were sleeping, but we wandered out to some other areas to see the giraffes, camels and even an ostrich. And then it was time to go back to the bus to head to our picnic. 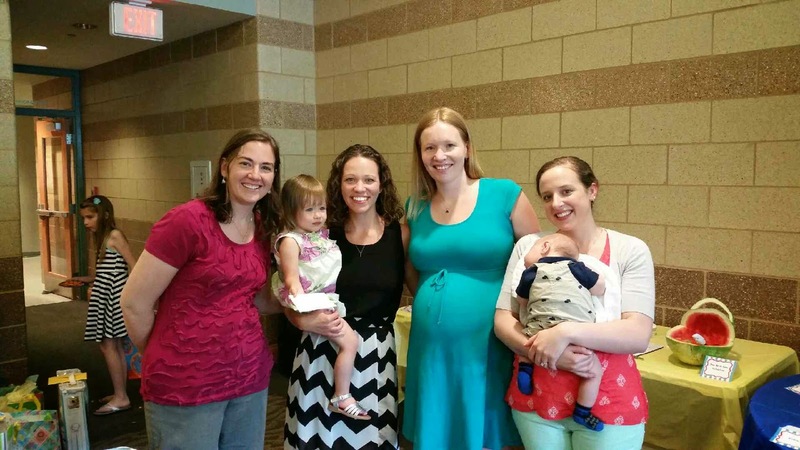 It was fun to share lunch with the other families in our preschool. We feel so blessed that they have all embraced our "Grace-filled journey" this past school year. They have taken us in, prayed for us, laughed with us and grown with us. You guys are the best, and we LOVE preschool! Holding hands with daddy at the zoo. And I would walk 500 miles and I would walk 500 more . . . Okay, so maybe I can't walk 500 miles, but I've always loved walking. In fact, it was one of Kyle and my favorite pastimes when we were dating. We would walk around downtown Hillsboro and just talk about anything under the sun. Running for Grace. It just doesn't get any better than this. Yup, I love to walk. Running on the other hand is a whole other story. I really need one of those T-shirts that say "If you see me running, you should run too, because someone is chasing me." And I truly mean it. But for others in my immediate family, that's not the case. Kyle took up running several years ago. In fact, he ran his first 5K with two of his siblings when I was pregnant with Grace. And while he probably wouldn't tell you that he loves running, I'm very proud that he sticks with it and keeps going. 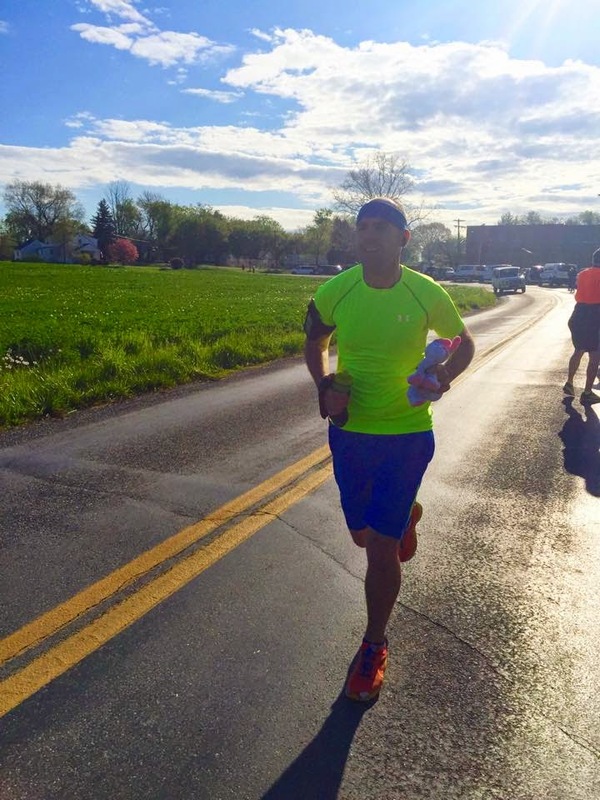 He's already run in five 5K events and is planning for three this year. Kyle's first 5K race. Grace was there too (sort of). 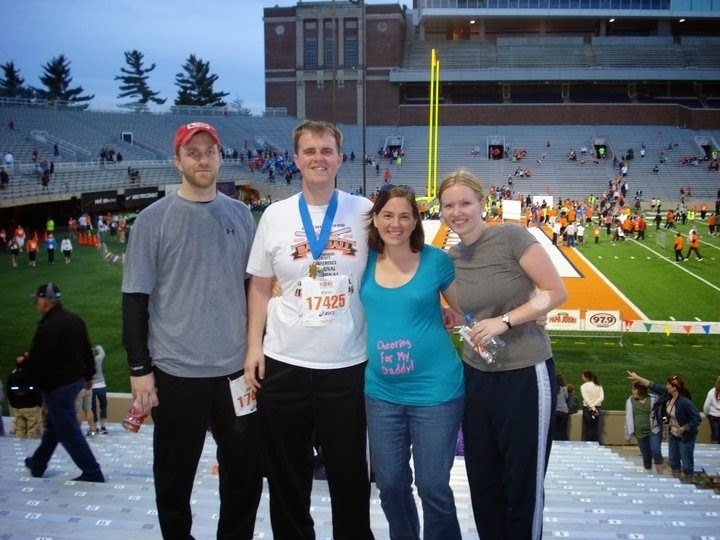 My brother and his wife, Emily, have also taken up running in the past few years. They've really embraced it and have run several long distance events. In December 2013, an MRI revealed that Grace's cerebellum was smaller than that of other children her age. At the time, we didn't know about INAD, and still felt that Grace would walk or maybe even run someday. Just after the first of the year, Johnny sent me an e-mail message that made me cry. He told me he set a goal to run 1,000 miles during the year 2014 in honor of Grace. I couldn't even imagine that. And I was so honored he would do that just for Grace. Throughout the year, I got periodic updates of his progress, and he stayed on track for the whole year. 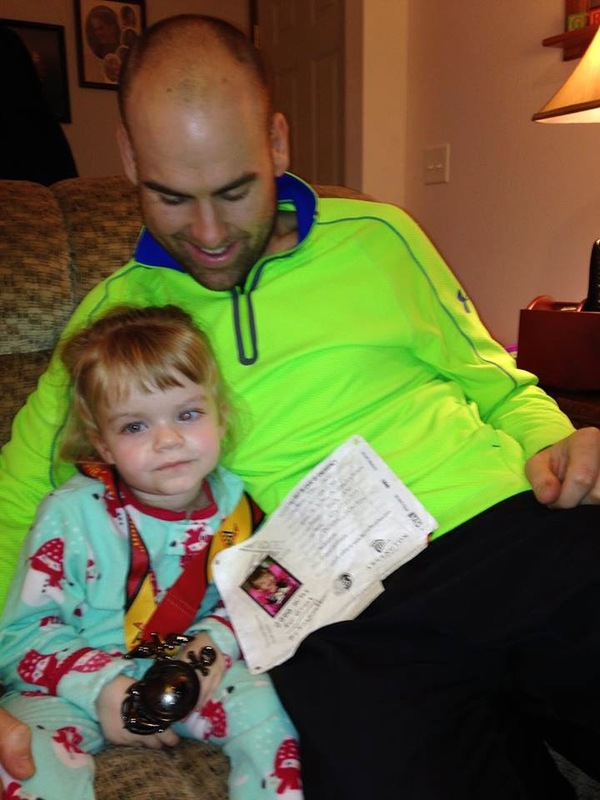 Johnny gave Grace his race medal from his first marathon. He even signed up for his first full marathon event at the end of October. I still remember that morning, he sent me a text that said "Today I run for Grace in hopes one day she will run by my side." 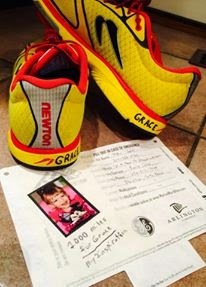 He even wrote Grace on his shoes and put her picture on his marathon bib. Then, when he was home for Christmas, he gave Grace his medal. He was hoping that he could finish his 1,000 miles when he was home for Christmas, and Kyle was even going to run the very last mile with him. But illness and cold weather kept them from finishing. He ended up finishing just before the end of the year at his home, and even sent me a picture. This is the day Johnny finished his 1,000 miles. So, Johnny being Johnny, started to think about how he could top that this year. 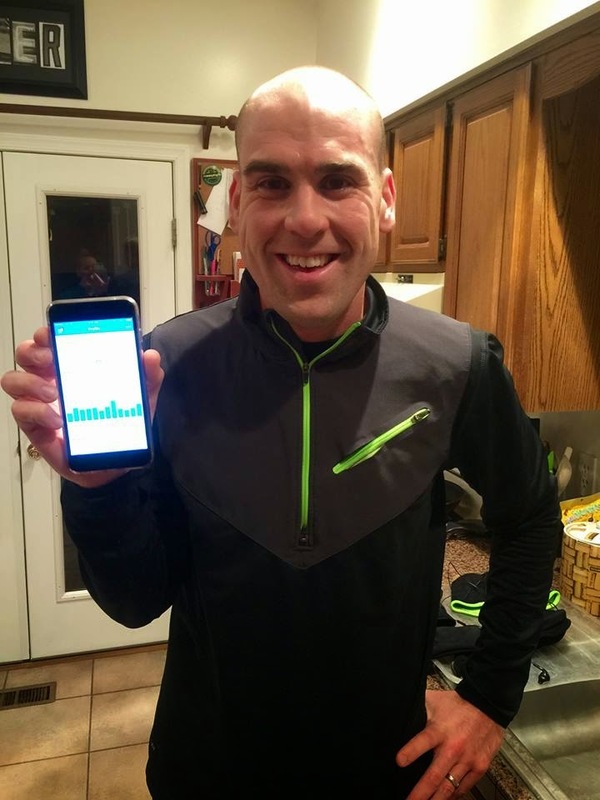 No, he didn't shoot to run 2,000 miles. Although, he did sign up to do the New York City marathon later this year. 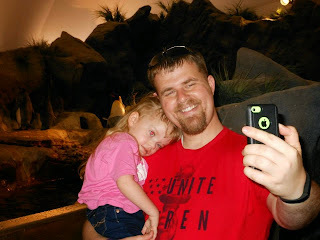 He and Emily decided on something that would give back to all the kids with INAD. They decided to plan a 5K fundraiser this September in Hillsboro. Plans are still in the works, but we are hoping for a huge turnout and celebration. There will even be a virtual aspect where you can run from your home if it's not that close to Hillsboro. Uncle Johnny and Aunt Emily (and Bruce) after the ten-mile Cherry Blossom run. 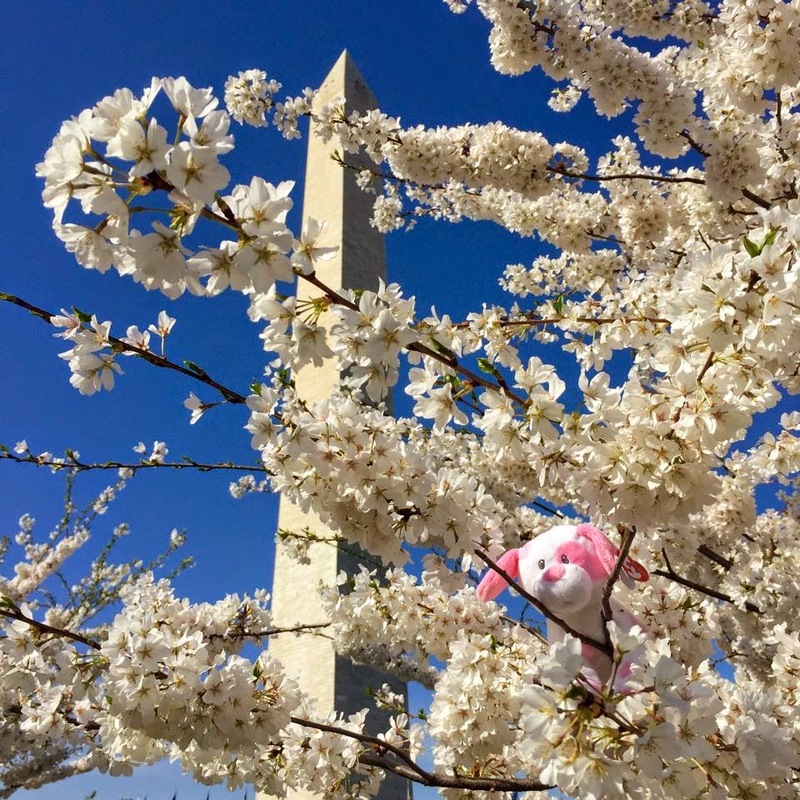 Check out Bruce in the cherry blossoms! To kick off the effort, they formed Team Bruce with some of their friends, and have been running with a replica of the pink and white stuffed puppy Grace calls Bruce. 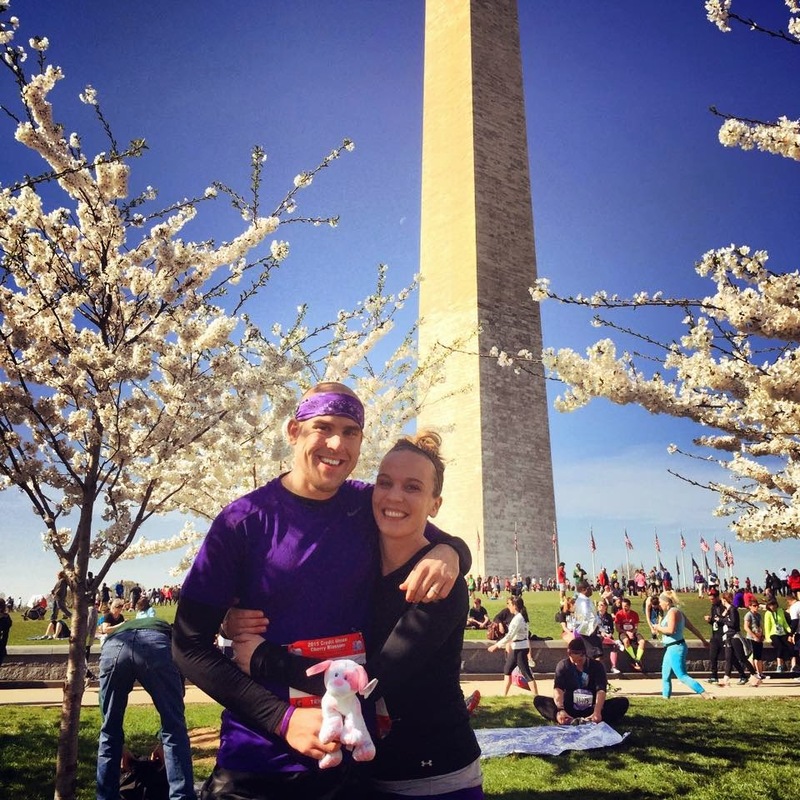 They started with a 10-mile run at the beginning of April in Washington D.C. through the cherry blossoms. Bruce made his inaugural debut as Johnny carried him throughout the race. Uncle Johnny and Team Bruce ready for the 200-mile race. 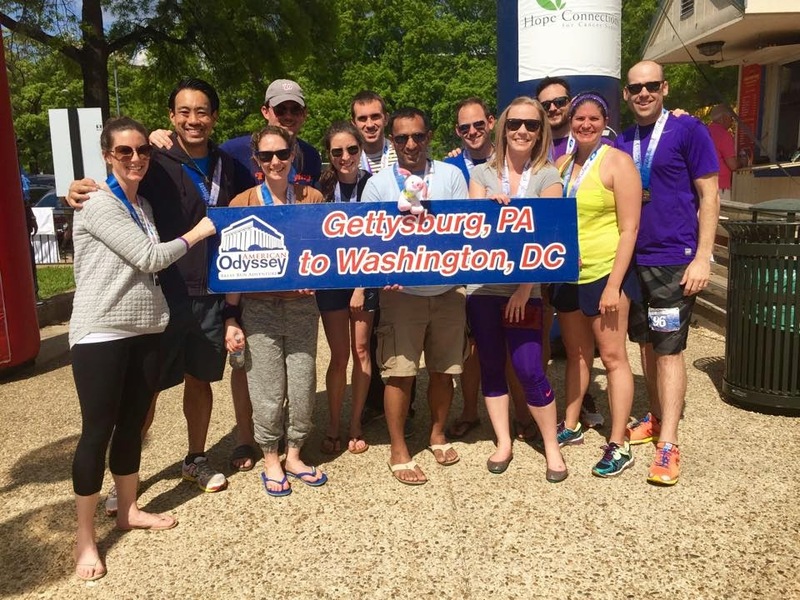 Up next was a 200-mile relay event this past weaken from Gettysburg to Washington D.C. with 12 people total. 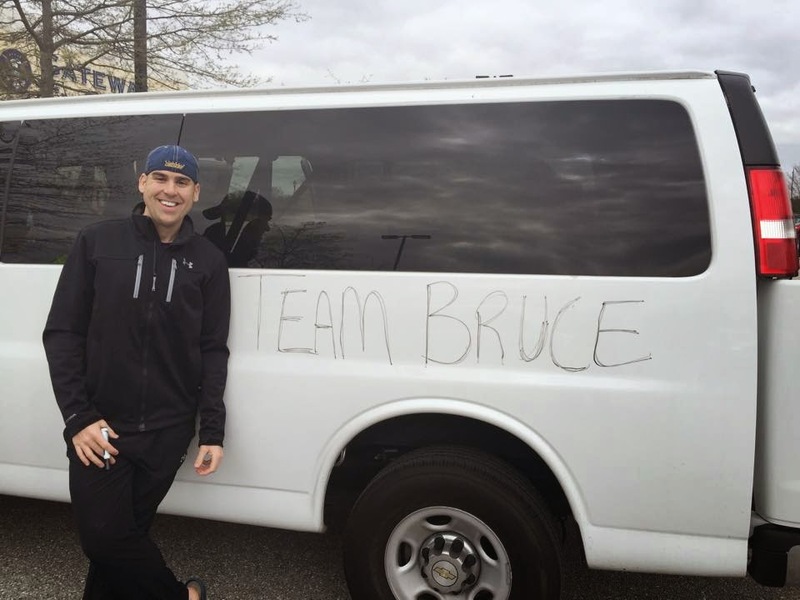 Each runner carried Bruce along their portion of the route, and he made it the whole 200-mile course. They even had a fundraiser before the event and raised $1,200 for the 5K event this fall. Uncle Johnny and Bruce making their run. On Johnny's final leg of the 200-mile course, he called and left me a voicemail while he was running (let's just say it was a little earlier than I usually get up). He told me how much Grace inspired him on his journey. It brought tears to my eyes to know how many people Grace inspires each and every day. Team Bruce after the race! Whether you run or walk (there's a 5K and one-mile portion), we hope you will join us in September for another awesome day in this "Grace-filled journey."